Can your RV score an A+? Elisa Norman of A+ RV Inspections, Inc. is a certified NRVIA inspector based in the Dallas/Fort Worth area. She received her Level 1 Certification in February 2016, her Level 2 Certification in June 2016, and her Propane Tech Certification in November 2016. She has completed her Registered Technician training with the RVIA/RVDA. Elisa has been performing inspections since March 2016. Her diligence and attention to detail ensure that you receive an A+ RV Inspection which can assist you in making an informed decision. 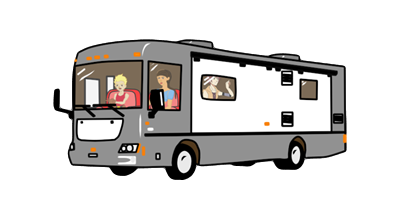 When you purchase an A+ RV Inspection, you can expect it to take several hours. You do not need to be present, but it's great if you can be. In order to receive the best results, the RV needs to have full hookups (30 or 50 amp shore power, city water, and sewer), and the refrigerator should be running 12 hours or more before the time of the scheduled inspection. There should be water in the fresh water tank and in the water heater, and a hose should be available for the city water. Your inspection focuses on safety, function, and form, and it provides a comprehensive examination of the RV from the roof to the tires and from the exterior sidewalls to the interior appearances and appliances. See the Services page for specific points of inspection. Once the inspection is completed, you will be emailed a thorough report with photos using Home Gauge software within 24 hours. Your inspector will be available by phone to answer your questions and give you feedback.